Not only does Byron Bay offer world-class surfing and gorgeous beaches for holiday goers, but it also features some fantastic fishing. So on your next Byron Bay holiday, don’t forget to pack your rods, reels and tackle box—you can get your recreational fishing license online or when you get here—and get ready to relish in the excellent fishing in Byron Bay. While Byron Bay may offer some great fishing, you need to be aware of the various protected areas in Byron Bay, all of which are part of the Cape Byron Marine Park. The park covers 22,000 hectares, from Brunswick Heads to Lennox Head. There are four types of protected marine zones that make up the area, and the list below will explain which Byron Bay fishing zones allow you to fish. Sanctuary Zone: No fishing allowed. Habitat Protection Zone: Recreational fishing only. General Use Zone: Both commercial and recreational fishing are permissible in these areas. Special Purpose Zone: More for research and management of the marine species. Tyagarah Nature Reserve—This nature reserve, north of Byron Bay’s main drag, features good shore-based fishing. Keep in mind there is a “clothing optional” beach south and adjacent to the reserve, just in case the kids are along. Main and Clarkes Beaches—Popular beaches also allowing beach fishing in Byron Bay. East Cape Byron—This area can be rocky, so beware. But this area does allow spearfishing, one of the few in Byron Bay. Tallows Beach—Great location for beach fishing in Byron Bay! You might catch tailor or jewfish when sending out a line here. Snapper Rock, The Channel and Jews Point—Just south of Broken Head Holiday Park, these locations are habitat protection zones and provide recreational fishers a chance to catch fish like mulloway, bream and tailor. In the Byron Bay area, you’ll likely see (and maybe even catch) such fish as Spanish mackerel, spotted mackerel, wahoo, samson fish, pearl perch, tusk fish, sand whiting, bream and flathead. The fees run from $7 for three days to $85 for three years—so if you want a cheap fishing trip, this is a very reasonable rate to be able to experience some great recreational fishing. Byron Service Station, 1 Shirley St.
Byron Camping & Disposals, Shop 16, Byron Plaza, 90 Jonson St. There are a few exceptions to those who have to pay for a license. See the NSW government website for more details. Note: If you are planning to fish with a guide or on a charter boat, you may be covered by the company’s exemption license. The owner should have paid an annual fee, which means you may not need your own fishing receipt. So be sure to ask so you don’t spend money if you don’t have to, and you can make this cheap fishing trip even more economical. Want a cheap fishing trip? 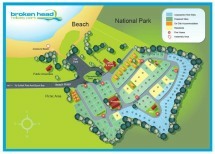 Book your stay at Broken Head now! If you’re coming to the Byron Bay area for a fishing excursion, consider staying at Broken Head Holiday Park this June and July when you and the whole family can take advantage of the School Holiday Special—kids stay for free when you book at least three nights at Broken Head Holiday Park! Rates start as low as $39/night. Don’t miss out on those great prices, book now and come experience fishing in Byron Bay and everything else the area has to offer. Coming to Byron Bay with a group or family? Check out our post on Byron Bay Fishing Options for Groups.